Siddhartha Gautama, who would one day become known as Buddha (“enlightened one” or “the awakened”), lived in Nepal during the 6th to 4th century B.C. While scholars agree that he did in fact live, the events of his life are still debated. According to the most widely known story of his life, after experimenting with different teachings for years, and finding none of them acceptable, Gautama spent a fateful night in deep meditation. During his meditation, all of the answers he had been seeking became clear, and achieved full awareness, thereby becoming Buddha. (Source). “Hatred does not cease through hatred at any time. Hatred ceases through love. This is an unalterable law. Which of these quotes resonated with you? 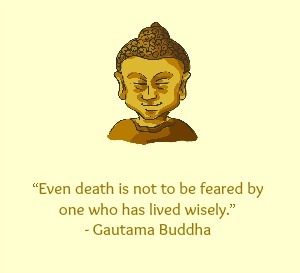 I would love to share another buddha quote which inspires me to this day. Yes, I love that jug. Because the jug of mind was filled drop by drop, by each quote in this post. So , if I were to choose the best quote, my jug would fill drop by drop ! I love this collection. It’s like a Greatest Hits page! “You are not punished for your anger, you are punished BY it.” Oh so true. Lovely collection here, Corinne. Thanks for sharing. Buddha’s enlightenment & gyaan is a truth. Glad that scholars have no doubt about his quotes, though they may argue about where exactly did he live. His teachings are so relevant even today. 1 of them is even in the recent movie- Ek Villain- Love can win over hatred. Interesting post. Thanks for sharing the wisdom. Great collection of wise words here! If only I can also someday live by such wisdom. Thank you Corinne! What a delightful way to start my day! These are truly inspirational. Some of them remind me of what you read in fortune cookies! These thoughts, especially, resonated with me. I have been punished by my own anger, anger punishes physically, mentally and emotionally. The other thoughts are truisms that you have expressed beautifully and that I understand, believe and try to live. This was the quote that stood out for me the most today. Not just for me but for my coaching clients, too. I find that women struggle with this. So many of Buddha’s sayings speak to me. Thanks for sharing all these great thoughts today. I enjoyed reading them and it’s a great list to come back to. These four made me think, and especially the last one, Corry, because it is something I have experienced often. The second one, I know it to be true, coz I’ve been shot and I have shot too, when frustration took over. Wise words and teachings. And you seem to have repeated one twice too by mistake 🙂 Nice post and I enjoyed reading it.